GliSODin® is a unique non-genetically modified melon extract naturally rich in superoxide dismutase (SOD), combined with wheat protein to protect its SOD activity within the intestinal cells. 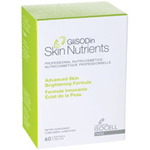 GliSODin was developed by Isocell Laboratories, based in Paris, France. Isocell Laboratories is a leading company in anti-aging medicine, clinical research, and dermatological advancemen. We offer Free Shipping on all product orders. 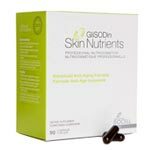 GliSODin Skin Nutrients Advanced Detoxification Formula is essential for cleansing and rejuvenating the skin, liver, kidneys and intestines for optimal health and well-being. • Cleanse the eliminative pathways (liver, digestive, skin, kidneys). • Removes toxins to promote clear and radiant skin. • Assists with weight loss. • Optimizes gastric transit time and relieves digestive upsets/disturbances. • Promotes liver detoxification and acts as a powerful free radical scavenging agent. 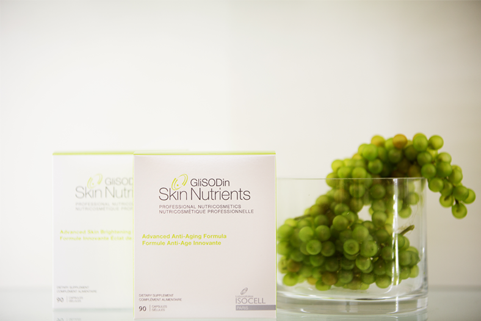 • Berries and Chardonnay Grapes: provide a full-spectrum of nutritious antioxidants for optimal health and radiant skin. • Alpha Lipoic Acid: chelates heavy metals and neutralizes several types of free radicals. • Milk Thistle: contains a mixture of flavanoid complexes that protects and promotes liver cleansing. • NutraFlora: an excellent source of soluble fiber to aid in digestion and elimination which assists in weight loss. • Broccoli: is high in sulforaphane which induces phase II detoxification enzymes for enhanced cleansing. • ID-alG: Seaweed that contains a natural source of vitamins and minerals to promote a healthy metabolic rate while controlling fat and carbohydrate absorption. • Svetol: Green coffee extract (decaffeinated) which has been clinically proven to offer beauty slimming benefits by controlling excess sugar. • Bromelain: An enzyme derived from pineapple that assists with digestion and reduces stomach bloating. • Green Tea Extract: Used to help boost your body’s metabolism. The Advanced Anti-Aging Formula contains GliSODin® and other complementary ingredients, which synergistically work to promote skin hydration and elasticity, structural integrity, and control accelerated aging caused by oxidative stress. It is an essential product that also has anti-inflammatory properties to reduce redness, and irritated skin that can affect all skins types. $97.50 / 90 ct.
• Rejuvenate and hydrate the skin to restore a natural healthy glow. • Reduces the signs of aging and protects the skin and body from damaging radicals. • Reduces inflammation that causes flaky dry skin and skin rashes and redness. • Krill Oil: naturally contains the potentantioxidant astaxanthin and is rich in omega-3s to provide hydration to skin cells and reduce inflammation that causes red spots and dry itchy skin. • Sea Buckthorn Berry Oil: nutrient-rich in vitamins, minerals, and carotenoids to promote skin clarity and immunity. • Cacao Bean: is high in dietary flavanoids to enhance dermal circulation and antioxidant action. • Hyaluronic Acid: provides structural integrity for the skin and collagen to improve skin firmness. 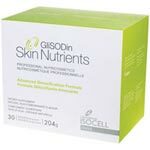 GliSODin Skin Nutrients Advanced Skin Brightening Formula was developed to promote even skin tone while working to protect and reduce UV skin damaged caused by sun exposure. The Advanced Skin Brightening Formula is a complement to facial aesthetic treatments designed to reduce skin discoloration. When taken in conjunction with these treatments, the Advanced Brightening Formula helps to support the effects and healing process associated with facial skin resurfacing. $85 / 90 ct.
• Protects the skin by reducing oxidative stress and minimize skin damage associated with sun exposure andenvironmental stressors. • Supports the beneficial effects of facial skin resurfacing treatments. • Reduces the incidence of side effects associated with facial skin resurfacing treatments. • Carotenoids: photoprotective and anti-inflammatory properties to help protect the skin and reduce inflammation caused by UV exposure. • Citrus Bioflavonoids: to promote even skin tone by inhibiting tyrosinase activity (the enzyme that promotes hyperpigmentation). • Borage Seed Oil: to soothe irritated skin while supporting skin's structural integrity. The Advanced Diuretic/Lymphatic Formula was designed to assist lymphatic drainage and reduce swelling caused by fluid retention in the body. Containing ingredients such as burdock and artichoke, this formulation has purification properties that help to eliminate toxins. Acting as a “mini-cleanse,” the Advanced Diuretic/Lymphatic Formula helps clear congestion from the circulatory and lymphatic systems and can also alleviate excess water weight. $55.00 / 60 ct.
• Green Tea: Contains catechins that are involved in detoxification. • Artichoke: Naturally full of phytonutrients such as quercetin, rutin, gallic acid, and cynarin, which help cleanse the body. • Dandelion: Naturally contains high levels of potassium and can help stimulate diuresis.